Ultra-low voltage large-scale integrated circuits (LSIs) in nano-scale technologies are needed both to meet the needs of a rapidly growing mobile cell phone market and to offset a significant increase in the power dissipation of high-end microprocessor units. The goal of this book is to provide a detailed explanation of the state-of-the-art nanometer and sub-1-V memory LSIs that are playing decisive roles in power conscious systems. Emerging problems between the device, circuit, and system levels are systematically discussed in terms of reliable high-speed operations of memory cells and peripheral logic circuits. The effectiveness of solutions at device and circuit levels is also described at length through clarifying noise components in an array, and even essential differences in ultra-low voltage operations between DRAMs and SRAMs. 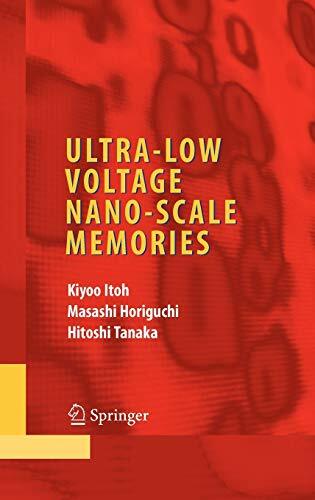 Ultra-Low Voltage Nano-Scale Memories provides an in-depth discussion of the state-of-the-art nanometer and sub-1-V memory LSIs that are playing decisive roles in power conscious systems. Emerging problems between the device, circuit, and system levels are systematically covered in terms of reliable high-speed operations of memory cells and peripheral logic circuits. The effectiveness of solutions at device and circuit levels is also described at length through clarifying noise components in an array, and even essential differences in ultra-low voltage operations between DRAMs and SRAMs. Moreover, various kinds of on-chip voltage converters necessary to solve problems with internal power-supply managements are extensively discussed. This authoritative monograph addresses these design challenges for memory and circuit engineers as well as for researchers and students who are interested in ultra-low voltage nano-scale memory LSIs.